Junglekat, Genesis 27:3 and Dark Cloud like this. It can fool you on species too! So was he standing still or running? Yeah I messed up with copy and paste and got pictures mixed up. Computer giving me fits, it kicks me off the internet if it sits for over just a couple minutes. Not sure if it is computer or Modem. Have to keep reseting the wifi for some reason. Bear skull is in another thread. Walking broadside at 22 yards. That wasn’t sporting you should have hollered at him to make him start running then shot him. Powerstro284, Ataulbe1 and Meatstick like this. Don't start it up again..LOL. These waterfowl hunters have died down somewhat..
What I was trying to do with the size fooling you things was look at the thread on what I got from moving the youngest back south and the bear skull. You would think a over 300 lb bear would have a bigger skull. I do remember he was 12+ inches between the ear's. He was a fall bear kill and fat as a butter ball getting ready for a long cold snowy Manitoba winter. Darn computer kept kicking me off the internet over a wifi issue and was resetting every 2 or 3 minutes and would go back to another screen for some reason. 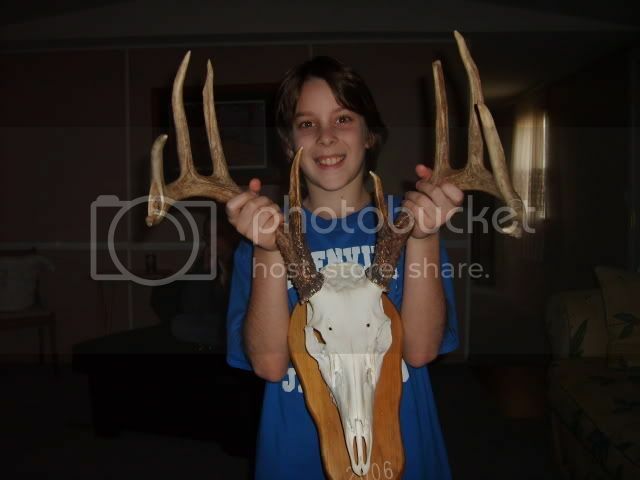 nice deer the grandson is holding, not sure who shot it. Pretty sure the Boss shot it in New Jersey.